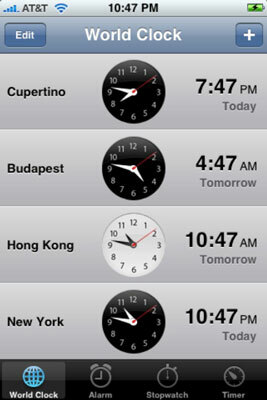 Your iPhone’s World Clock lets you display the time in numerous cities around the globe. Tap World Clock (inside the Clock application) to activate it. Check out the time in Budapest. Tap the + symbol at the upper-right corner of the screen and start typing a city name with the virtual keyboard. The moment you type the first letter, in fact, the iPhone displays a list of cities or countries that begin with that letter. So typing V will bring up both, Vancouver, Canada and Caracas, Venezuela, among myriad other possibilities. You can create clocks for as many cities as you like, though the times in only four cities appear in a single screen. To see times in other cities, scroll up or down. To remove a city from the list, tap Edit, and then tap the red circle with the white horizontal line in it to the left of the city you want to drop. Then tap Delete. You can also rearrange the order of the cities displaying the time. Press your finger against the symbol with three horizontal lines to the right of the city you want to move up or down in the list and then drag it to its new spot.